Today was a beautiful spring day, but someone forgot to tell Sam that news. He woke up in his usual fashion, happy and more than willing to give a morning hug and kiss with an enthusiastic, “Goooood Morrrrning, Mommy”. He even drank his juice (which for Sam consists of vitamins, coconut milk kefir and distilled water) which was requested beautifully with a “Mommy, I want juice please” but that is where the happiness ended. He didn’t want to get dressed which resulted in a full blown sobbing jag along with throwing his clothes across the room. When he finally got dressed his pants were on backwards and after some subtle prompting and complaining they finally got turned around. He didn’t want to start up his daily NACD program. His vocabulary seemed to only consist of a single word “NNNOOOOO”. I tried to give him choices, which he was more than happy to scatter across the table. I tried to reason with him, which just made the ever present “NO” even louder. I tried to move our program elements outside for more intensity. Sam ran off happily waving “Bye bye.” I tried to turn his running into a learning game, but he quickly figured it out and promptly told me to “Go Away”. I brought out his book and began reading it to myself hoping to lure him in. He simply ignored me. I began to pray, because I know when the morning begins this way I quickly lose my intensity and the negative aspects of raising a child with special needs hit me smack in the face. I asked him what was wrong, as if I expected him to simply tell me what was bothering him. I continued to spiral to that place where no special needs parent likes to go. I decided to try a different environment, which sometimes works for Sam, so we went out to a local restaurant that allows me to pick and choose those items that work within Sam’s SCD diet. I tried again to work with him but was met with the same resistance — only now we were in public. The negatives of our situation quickly outweighed the positives and I became as frustrated as he was. I simply gave up, but not only did I give up, I decided to dwell on the negatives. 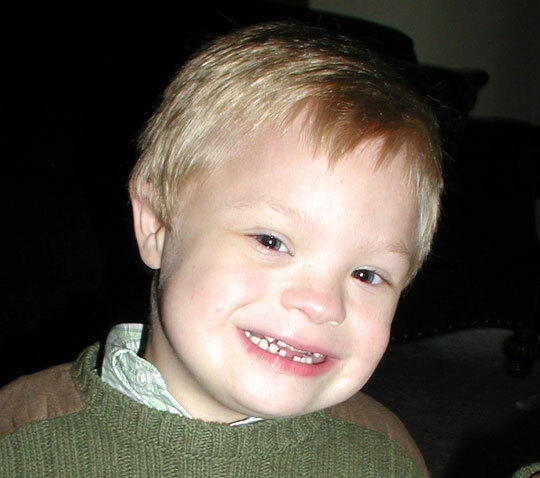 I began to dwell on Sam’s Down Syndrome . . . his brain injury . . . his lack of speech . . . was the diet worthwhile? . 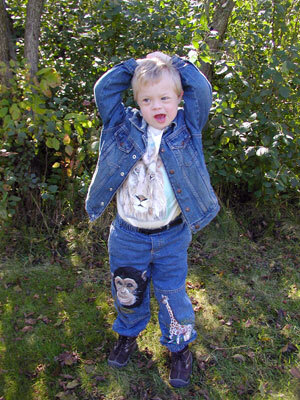 . . why did other kids with Down Syndrome seem to progress easier? . . . will he ever get to where I thought he would or could? . . . why does this all have to be so hard??? I packed Sam up in the car and decided the best thing for him and I was to give it a rest and get some exercise. So we went to a local park that has a lot of walking paths, bluff views over the lake, a bird sanctuary and at the end of the longest trail steps down to the beach. We began to walk and Sam began to complain. My mind was thinking, why can’t he just take a walk like any other 7 year old? . . . oh yeah, low muscle tone, easily fatigued, yada yada yada. We made it to the first cliff and we sat down. Sam pointed to the water and told me “lake”. He pointed toward a noise in the sky and told me to look at the helicopter. My mood was slowly changing. We got up and continued our walk and as we walked, I began to notice his actions and was amazed at how easily I came to new thoughts and conclusions. As we walked Sam continued to voice his opinion (something I have always wanted him to be able to do). Often he took my hand and walked side by side with me, other times he would run off ahead with fearless abandon, hmmmmm sounds pretty typical in the scheme of life. I was humbled. The moments on the walk came back to me although now I saw them as little life lessons that someone beyond Sam and I was desperately trying to teach me. Sam may not speak clearly but his actions can tell you volumes. His complaining must sound to him very much like my own complaining when things don’t go right, I’m tired or I’m not happy about something. After all, children learn from example and Sam learns when that example is repeated time and time again. The pinching and pulling back, again and again, remind me that I have over-committed myself and he simply needs me. The tenacity and determination to push on remind me that even though we will have our successes and failures we need to push on. We need to simply keep going, to work together and the journey over time will get easier with prayer, strength and maturity—even if the trials become greater. This life after all is a journey—not a vacation, not a job to be dreaded, but a journey with good times and bad times, accomplishments and failures, likes and dislikes but always, always an adventure. Sam’s walking with me, running off ahead and sometimes following behind is who he is and what he needs. Sometimes he needs me to be his equal, sometimes I need to let go and let him achieve or fail but always learn, and sometimes I need to be the one he follows. It is during these times that I am the one being taught. Sam’s stubbornness (which we like to call persistence), his desire to trudge on no matter how tired or frustrated he is inspires me. In many ways he’s much stronger than I am, his hurdles are so much higher than my own and yet he pushes on, he chooses to. My frustration this morning could never equal the frustration he must feel when he speaks but no one understands, when he tries to listen but doesn’t hear things clearly, when something is wrong but he can’t express it, when he’s frustrated but can’t explain why. Tonight, hug your children a little tighter, let them know that no matter what, you are in this together and push on. Tomorrow is a new day for Sam and I. We will continue our journey and trudge on.